Banking on the skills of our qualified team of professionals, we are involved in providing Lift Installation Service. This lift is useful for duplex, bungalow & row houses. No machine room is require & no dip pit requires. Work on single phase. Soundless & maintenance free operation. We do AMC contract in Pune, Nasik, Goa, Satara, Ratanagiri, Raigad, Sangli, Kolapur, Dapoli. 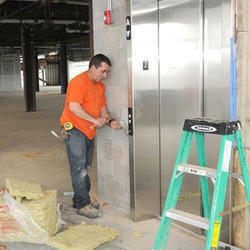 We are engaged in offering Elevator Installation & Maintenance Services. We are capable of providing most efficient and reliable services for elevator installation & its maintenance for our clients. Our Lift Installation Service is highly acknowledged among our clients due to their trouble free performance and high reliability. Elevator Installation Service is offered to the customers to attain their maximum level of satisfaction. Moreover, it is executed by a team of experienced experts. We devote some-time with our customers so as to understand their demands related to budget and then deliver them to our customers so that our service will match with their demands completely.